Are you having trouble with your air-conditioning and heating unit not performing properly or even not at all? Please contact your local service experts! We are here to serve you by providing fast, reliable and economical AC service in Orlando, FL. Hiring a professional to maintain your air conditioning unit should always be priority number one. A professional will check over your entire AC system, including the places that you might have forgotten to check on your own. They know which areas to maintain, clean, and repair also the right time to do so. Professionals have air conditioning knowledge and equipment) far beyond what the typical house owner would know. If your air-conditioning unit goes down at an inopportune time, we are here to provide 24/7 emergency service for you! We strive to provide you with honesty and integrity in all that we do. Our flat-rate diagnostic includes travel and troubleshooting so we can provide you with an accurate quote for your repair. We guarantee that you will know what the repair cost is without any surprises. When an AC unit goes year after year without any maintenance or upkeep being done, each year of no maintenance will lower the unit’s effectiveness by up to 15%. This is a seemingly small percentage but it increases your utility bill as well as your AC maintenance bills. If you look at the overall cost of your AC unit with added in costs of repairs versus the overall cost of your AC unit without any repairs, you might be surprised when looking at the price difference. Yes, there are initial costs factored into having a professional regularly come and inspect your air conditioner. Yet if you look at a yearly maintenance contract, it is much less expensive to have your unit regularly maintained versus ignoring it until a major problem happens. With a poorly maintained unit, you have to factor in the higher utility bills and the additional repair charges to the overall cost of your air conditioning unit. The majority of families spend the larger part of their utility costs on their air conditioner expenses. 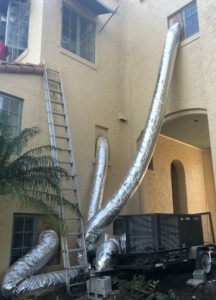 With the unbearable Florida heat, this costly necessity can be reduced with a professional’s help. Our professionals are trained to catch problems before they turn into major costly issues. One of the major costly issues that a professional can help you avoid is informing you when the proper time is to replace your AC unit. If your AC unit is properly cared for and maintained, it has the possibility of having double the lifespan versus if it remains ignored. Eggert Cooling & Healing Solutions will take care of your largest or smallest repair. We are available in Orlando, Apopka, Clermont, Deltona, Sanford, and nearby areas. Our professionals will help take care of your AC concerns with honest assessments about your unit. For a fast, economical and reliable service, give us a call today or schedule your appointment online at your convenience. You may reach us at 407-252-3785 for a free estimate!